Kansas City locals have been keeping a secret and it’s a really tasty one! There’s a New York style pizza Kansas City restaurant hidden away that needs to be on your list of must try places. It really is a hidden gem that is serving up amazing food. The pizza here is just too good to keep to myself, so I want to share the yummy details with ya! IN A TIME LONG, LONG AGO back before the internet, you knew a local restaurant was good when the parking lot was full of cars and there was a line out the door. Well, the Italian Delight in Kansas City, Kansas is one of THOSE places! 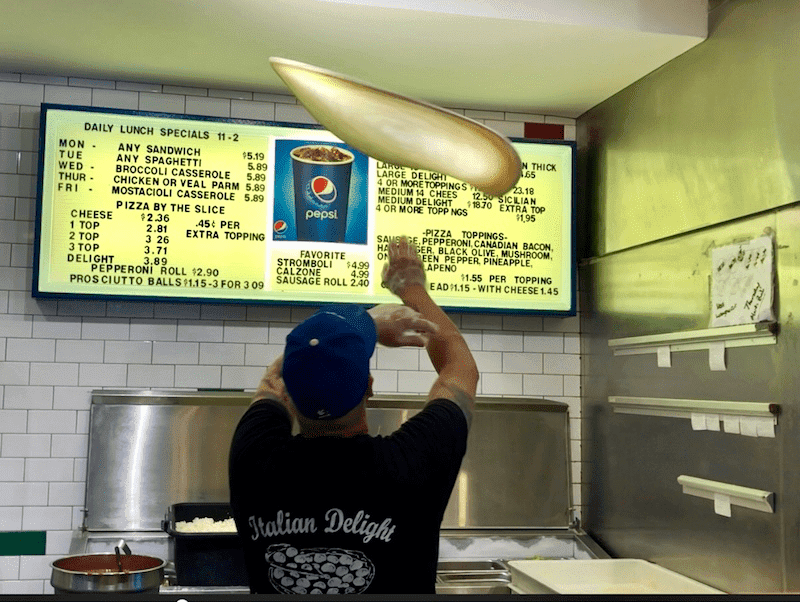 This Italian restaurant has been serving up New York style slices and other Italian favorites since 1977. The restaurant began when two brothers came from New York to see a KC baseball game. They discovered there wasn’t a good pie (pizza) shop in the area, so they decided to stay and open one. Today a second generation with Renee Brunetti at the helm run Italian Delight. Here he is behind the counter. Just look at the size of that pie!!! 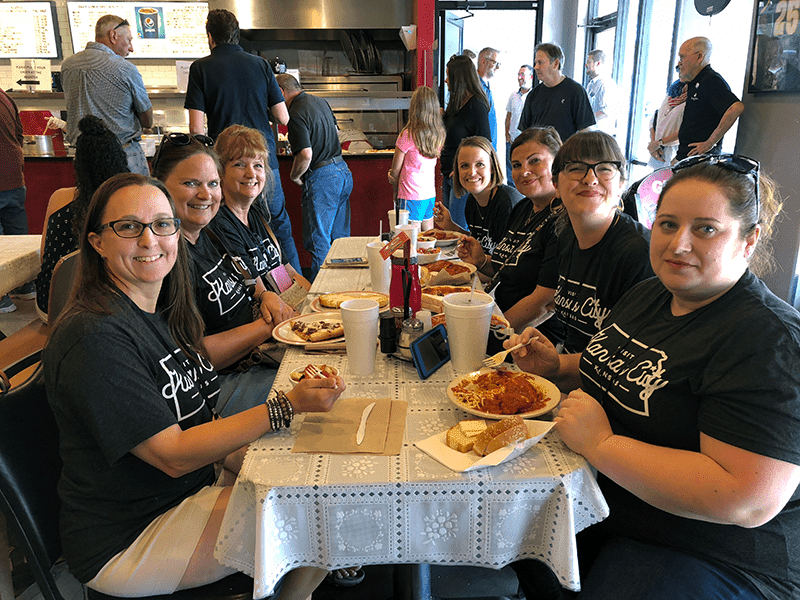 On a recent trip to Kansas City, Kansas (KCKS), I stopped into Italian Delight with a group of friends and fellow travel writers. We were all in town for a press trip and discovered for ourselves just how good this pizza Kansas City restaurant really is. I can totally see why locals call it the best pizza in Kansas City. My food pictures really don’t do this place any justice. But it’s simple food that tastes amazing! The pizza crust is a perfect example of New York style crust. 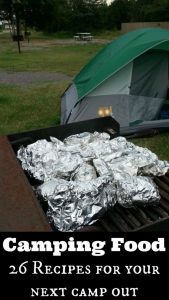 It’s thin and can be folded in half to be eaten just like it would back east. It’s a little sweet too, which I like. Then it’s loaded with cheese and toppings. I tried the all meat pizza and it’s a carnivore’s dream. 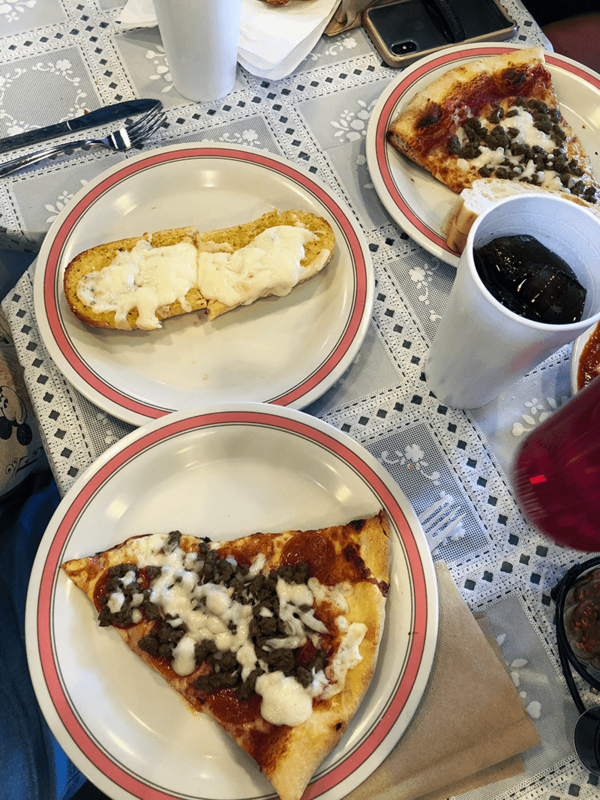 Get Pizza by the Slice – Cheese is $2.36 and each additional topping is $0.45. Slices here are huge and more than enough for lunch. Want a Whole Pizza? You can order that too and feed a small army. 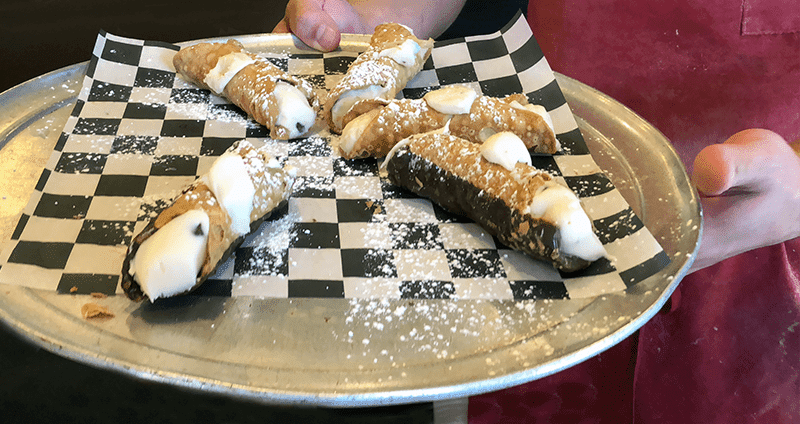 Whichever you decide, save room for a cannoli or two or three. You can’t go wrong with three! 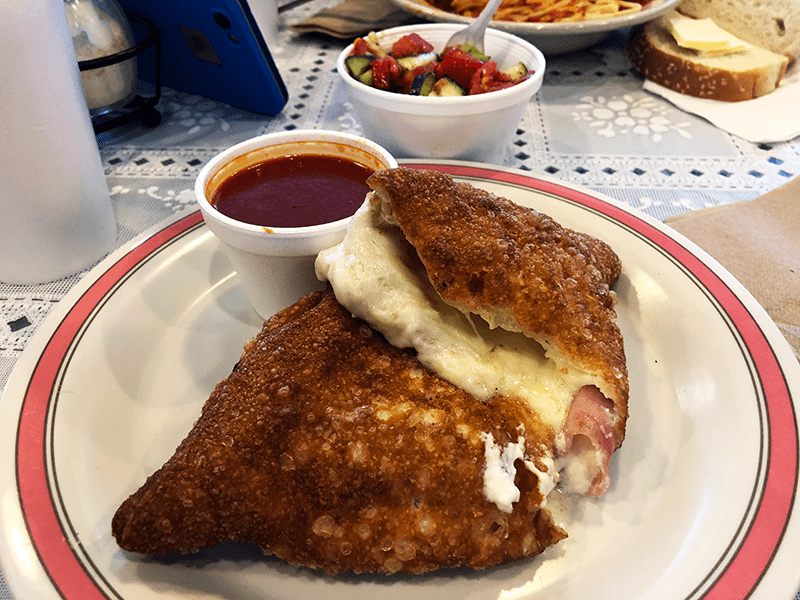 Calzone: Stuffed with mozzarella cheese, ricotta cheese, and deli ham. All this for just $4.99. This was hands down my favorite dish because it was cheese, cheese, cheesy goodness! Topped with homemade red sauce/gravy that was everything!!! Health Salad: Tomatoes and cucumbers marinated Italian dressing. 8oz for $2.35. Simple veggie salad to add to the carbs in the pizza and all the cheese in the calzone. 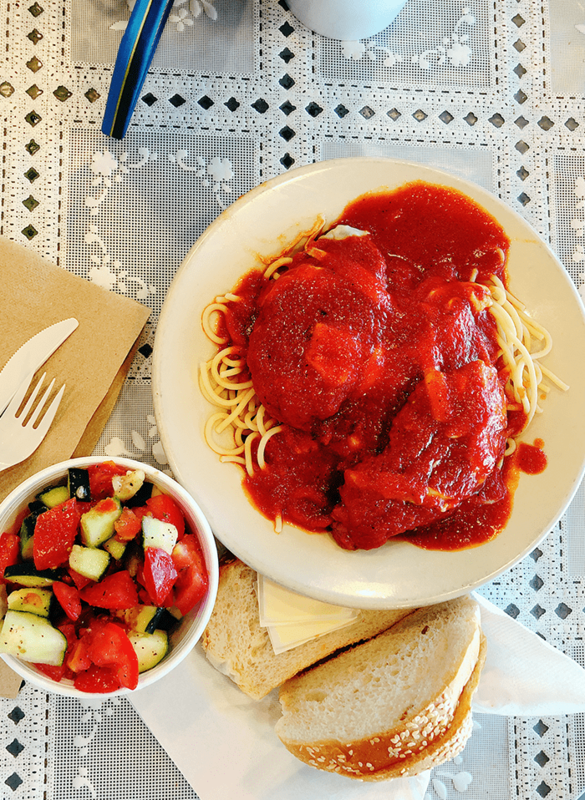 Chicken Parmesan: Lightly battered chicken cutlet served over pasta and topped with sauce. Served with freshly made Italian bread. Simple and delicious! On Thursdays, it’s the daily lunch special at $5.89 and it’s a big portion! Before I wrap this up, I want to say something about where this restaurant is located. At the beginning of this piece I talk about how one would find great places before the internet, google, and Yelp. 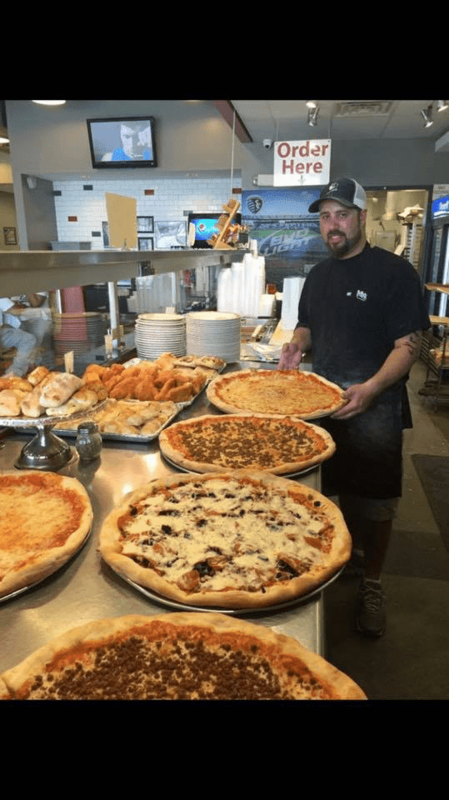 You’ll find this pizza Kansas City restaurant in a small unassuming strip mall on 82nd Street and State Avenue. If you didn’t know this place was here, you’d probably drive right past it and miss out on all the goodness. But the line out the door at lunch is a clue that something pretty good awaits you inside. 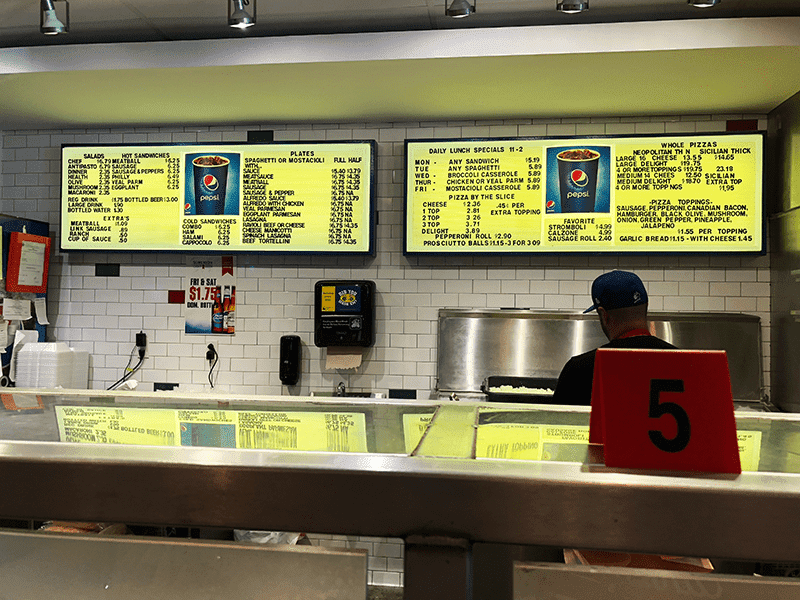 Once you enter the restaurant, you’ll walk along the counter viewing a few of the food offerings available, order your food, pay, and find a seat. 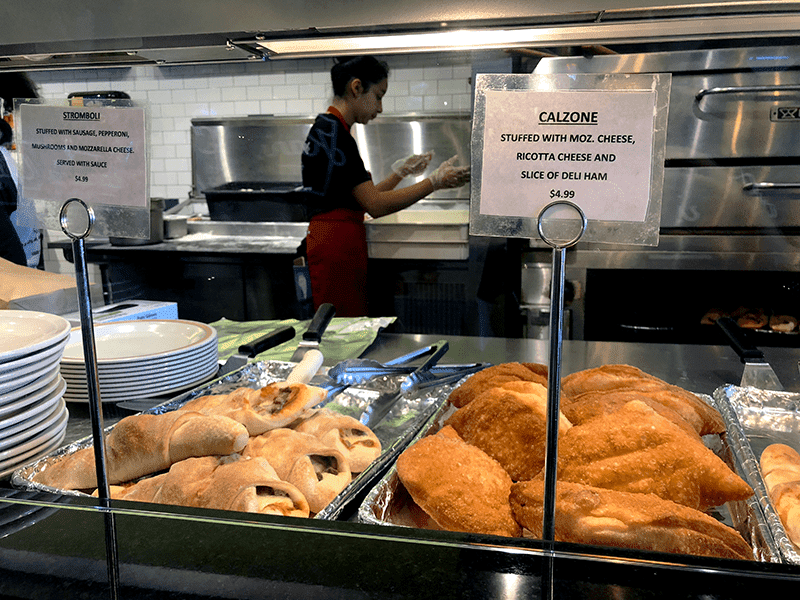 It’s a little like the pizza shop at a mall food court or a small cafeteria. But at Italian Delight, your food is brought out to the table once it’s ready. Service is fast and staff is always friendly. Want to read what other visitors and locals say about Italian Delight? Take a look at these reviews on TripAdvisor* and/or on Yelp. 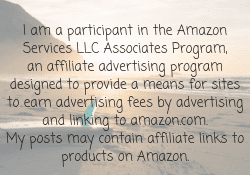 (* This article contains affiliate links. Purchase through our affiliate links and we receive a small commission without any extra expense to you!) 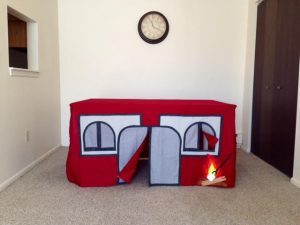 Visit www.italiandelightks.com for days and times. For the best pizza in Kansas City, make plans to visit Italian Delight. They’ve been serving up pizza Kansas City locals and visitors just can’t get enough of. You can’t go wrong with this KCKS institution. Thank you to VisitKansasCityKS.com for hosting me on this recent press trip. All opinions are mine and based on my most recent adventure. I am so happy Maila introduced you to us. Now everyone can enjoy that delicious food you and your family serve each and every day. I'll be back next time I'm in town.